Pee wee MX riders need upper body coverage that fits properly. The Fox Racing Titan Pee Wee Motocross Roost Deflector gives pee wee riders a comfortable, non-bulky fit, that’s easy to get on and off. 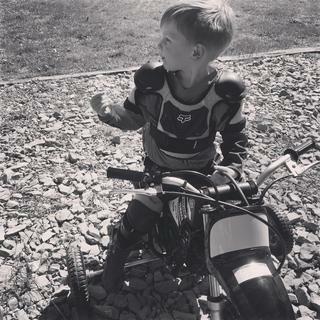 With the Fox Racing Titan Pee Wee Motocross Roost Deflector all they have to worry about is the ride. Comfortable, non-bulky fit, that's easy to get on and off. Specifically designed to be flexible and comfortable, while giving peewee riders ample coverage. Strategically shaped perforated foam chassis sculpts to body and provides great airflow. Easy to use elastic waist straps with Velcro closure. We got the M/L for our 4 y/o son and it fits perfectly. He’s 40 lbs for reference. He loves it and doesn’t have any issues with it so far. It’s a little shorter than I’d like, but it’s ok for now until we take the training wheels off and let him go a little faster on his dirt bike. It’s my daughters first chest protector, she loves it! The only reason I didn’t give it 5 stars is because it’s too soft. Great protection for my daughter. It fits her well and still feels comfortable as she rides. The waist adjust easily. Velcro attaches very well. I am impressed with the quality and he really likes wearing it. I bought the roost deflector for my 4 year old son to use during practice and his races. The fox defector is really durable and it covers his entire mid section above his stomach. Bought this for my daughter and it fit perfectly. She says its very comfortable and it doesn't appear to hinder her riding. The material seems like it will get tore up fairly easily after a crash but time will tell. All in all a good piece of equipment at a good price. I bought this for my son and he never wants to take it off. Its really easy to clean as I just wash it in the washing machine with the rest of our gear. The only complaint that I have is that the arm bands are stretched and there is no guide for them so they always sag out of place. Great price and fast shipping! 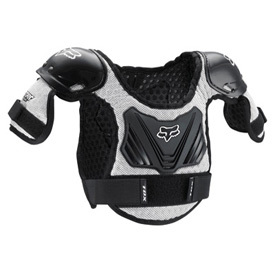 Purchased for our son, age 5 now 6, chest protector fits very nice and true to size. Protector has held up for 2 race seasons now and made very nicely. Good quality, easy to adjust. This protector works great. gives my kids protection and doesn't restrict there movement to much. Chest protector fits small children and is better than no protection at all. It is comfortable for the child but doesn't offer much protection. There is not any hard plastic like that on an adult chest protector. I started my boy with this one and as soon as a he could wear a youth protector I switched. I bought the medium for my undersized 4 yr old and the large for my 6 yr old. I'd say the protection is really good for the kiddos, however I will say they are really small! I think my 4 yr old should have worn the large and my 6 yr old upgrade to a hard shelled protector. These didn't give much stomach protection either, I'd say these are for kids 2-4 yrs of age in general. Also they hold in heat, my boys got real hot with t shirts under them (it was hot out though). Quality was good and they are durable, all in all great protection for the little ones. good for really little guys. Good for my 5 year old on training wheels. Think I'd be looking for something a bit more protective when he's really ready to go a bit faster. Lots of foam, but little hard plastic protection on the chest. Bought this for my 6 year old that wanted a chest protector like his big brothers....fits great and is comfortable so he will wear it! Great price. The Pee Wee Roost Guard by Fox fit great. My 5 year old is thin and he gives him plenty of room to grow or layer clothing. The shoulder area was a little to big, but he will grow into it soon enough. The price was also a good part, its hard to find anything made better. My five year old son has been wearing this for over a year. It fits well and has worked great. It offers good protection and padding. He tipped over regularly when he first started wearing this and it has protected him from any injury. As he gets more aggressive the crashes get worse and this keeps protecting him from the impacts. It still appears to be in excellent condition. My 8 year old son wears this all the time, he's small for his age so the sizing is just right. Good for beginners and builds his confidence. All kid MX riders should wear this type of protection, even if it just stops rocks from other bike. We make our 4 year old wear them everytime he rides. Hasnt wrecked yet so cant comment on how well they protect. Purchased 2 for my 3 & 5 Yr old grand daughters, pretty cool little product. Good quality and a good price - my 8 year old likes the way it fits AND the way it looks - never underestimate the "looks" factor - if you think you look good, it can improve your confidence/performance. The only thing I am not comfortable 100% is that the front and back are not hard. Chest and back are protected by a (not so hard) pad. This is OK for beginners but the protection is minimal. I would not recommend for racers or more aggresive kids. Son loves it and it fits well. However I would like more chest coverage. This has been a great chest protector for my 5 year old, my youngest will inherit it this season. my little boy loves his chest protector. its very easy for him to take on and off and keep handy to throw on at a moments notice. Fit my 3 year old great. Great product for the little one. Priced right, this protector is perfect for your kids while giving them rides, and while they are learning to ride a bike themselves. Fox has hit it just right with this. My little boy is 18 months old it fits him good and he is not bound up he can move freely and gives mom the piece of mind knowing he is safe. foam protector so bends and gives. Pretty good product considering nobody else seams to offer something this small for the little ones. Provides more of a padding type then a hard plastic protection. Looks great! Kids like it. I have a 8 yr old son what size chart should I use for this chest protector? BEST ANSWER: I would second Julia's recommendation. If you follow the sizing chart provided, you should be good to go.